These were the colours that introduced me to Cascade Casablanca – Poppyfields. My fingers eventually settled on a pattern – what I call the biased basketweave pattern, and I thought that it would show up the colour changes nicely. The pattern is actually called ‘Not Entirely Entrelac’, which I’d found while browsing for a good beginner pattern to learn entrelac. I still have to complete an entrelac project, but in the meantime, I use this. I’ve been working on this during the work commutes as well – and I’ve had to frog a few lines now and then, as we go into the tunnel and I’m plunged into darkness in the middle of a row. Why I never remember to turn on the overhead lights, I don’t know. I’m almost done with it. I forgot that I had another skein, and didn’t make this wide enough for a cowl. So maybe it’ll be a long scarf instead. We’ll see where my mood takes me. Here’s all the other fashions that caught my eye. As I had said before, my fingers have not been itching yet to make any type of clothing such as these. Perhaps some time in the future when I know I’ll have uninterrupted time to sit and learn how to make a sweater. Sure to keep your ankles warm! Was trying to figure out this pattern! I’m sure she made this herself! That neck warmer in the middle is my next project! Love this jacket and the colour too! The Malabrigo SM Gold – I was so excited with the colours and started another scarf while I was travelling, right after I finished the brioche scarf. I finished it a week later, and then I didn’t like it. This is what it looked like the first time. I didn’t like it because it was too long and skinny – it was down below my knees! As usual, I casted on too many stitches underestimated how much the project will fluff out once you start knitting. And so I frogged it, and started another scarf, in the basketweave on the bias pattern (or the Not Entirely Entrelac pattern). As I was finishing up, I decided that I wanted to make it into a cowl instead. So I had to do little bit of figuring out on how to join the zig-zag ends together. Instead of decreasing on both ends, I knitted two blocks on one end, and decreased one block on the opposite end, so that both sides would line up with the pattern. I think I did okay – that’s the join there, after I’d matched up the blocks. It’s a little puckered, but with use and wear, it’ll settle in. I also slip-stitched around the edges, to make them a little firmer, and the points a little pointier. This is what the other side looks like, after a crochet slip-stitch join. And another scarf finished just in time for New Year’s Eve … and it was freezing cold weather outside. And I’m really enjoying working with Malabrigo yarn. So, I narrowed down the projects to take with me during my trip to San Diego on the knit not-quite-entrelac scarf, and to start a new crocheted cowl with the lattice pattern. I started crocheting even before take-off. This is how much I had done by the time I got to Charlotte for a stop-over. Soon after take-off to San Diego, I crocheted for three hours on the plane. 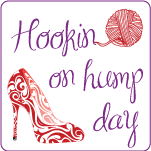 During the week, I would either crochet or knit, depending on the mood. I finished the one skein of yarn for the cowl, and would have gone on crocheting if I had brought another skein with me. I think my tension is getting tight again, since it’s curling at the edges. Something to work on with the next skein. On our last night in San Diego, as we sat around the kitchen table chatting, I knitted as fast as I could (which wasn’t very fast) to finish up the skein that I had brought with me. But with only about three yards left on the skein, we had to turn in for the early morning flight. I did get a lot done, though. This will also finish quickly, once I settle down and start up the WIPs again … after I catch up on what went on while I was away. I’ll be travelling to San Diego tomorrow, and I’ve been dreaming of the five hours of uninterrupted yarn time I’ll get flying to and fro. I’m in a tizzy and my head has been going round and round for the past week, thinking about what to take with me on the plane, and what to pack in the suitcase. Will I have time to visit yarn stores over there? Do I start a new project on the plane? I’ve been itching to start something with this … I was thinking of a lattice crocheted cowl, or try a new knitted pattern with this. even though I found a mistake early on, but decided not to frog it. I just made it part of the pattern, and it has fitted in. And the WIP that I recently re-discovered? 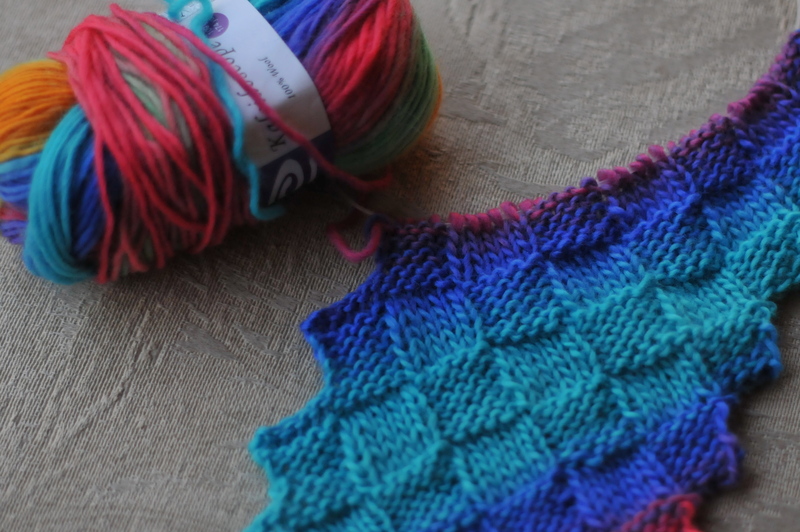 I frogged that too, and started on a new pattern – the Baktus scarf. This is what it looks like so far. Another crocodile stitch scarf that I’m playing around with, using two colors. A bit bright, but I think it works together. So now that I’ve narrowed it down to these, I better start packing the suitcase. If you ask me, I’d pack it full with yarn and WIPs. Don’t you think? After the fifth attempt (or more? ), this is my new stitch learned, to add to my repertoire of stitches. The entrelac stitch, in both knit and crochet. Last year’s new stitch was the crocodile stitch, but I think I used the crochet moss stitch more for my projects. So I’m still working with the crocodile stitch as well. This is actually not a true entrelac – it’s more of like the basket weave stitch, knitted on the bias, which makes it look like the entrelac. Now that I have an idea of what the entrelac is about, hopefully I’ll be able to follow the instructions for the true knit entrelac stitch. The crochet version was easier than I thought … well, I still have to figure out how to work the side triangles, so I’ll be experimenting with that next. Back to this … Using my new purchase, Kaleidoscope wool yarn, by Elegant Yarns, Inc., I started out following the pattern, row by row. When I knitted about six inches, the scarf didn’t look wide enough. So I frogged it, and started over again. This time, I repeated the base pattern twice, to add two extra squares, before the repeat pattern for the body of the scarf. This made the scarf about six inches wide now. As usual, I made a slight change from the original pattern. The original pattern has the right side showing the entrelac stitch, and the wrong side the purl stitch. I modified my pattern so that both sides are showing the entrelac stitch. The yarn is self-striping, but with this pattern, the color changes coincide with a new row of squares, rather than in the middle of a row. I’m enjoying this pattern and stitch, and I already have ideas of what to make next, with different yarns. Perhaps this year, I’ll have my Christmas projects with the new stitch pattern done in time!